I had been reading a lot about using pork rinds to coat various meats, but didn't have the desire to create a recipe with them. Well, I needed dinner one night and I happened to have chicken drumsticks and Epic BBQ pork rinds, and figured it was time to take the plunge. I found out recently that I have a very strong sensitivity to both egg whites and egg yolks, so in order to make the crushed rinds stick to the chicken I tossed the chicken in oil. I may never use eggs again to provide a good sticking medium, combined with always using BBQ pork rinds! WIN–WIN. Furthermore, full prep (including crushing the pork rinds) took less time than it took to preheat the oven. And, only three ingredients! You can't get easier than this! 2 lbs chicken drumsticks — skin on, bone in. Put pork rinds in a food processor or blender. If you want a coating that is crunchy, pulse or blend just a few seconds and keep checking the consistency. If you want something more like a ShakeN' Bake coating, process longer. Put the oil in a big bowl and toss/coat chicken in oil. Add the crushed pork rinds and toss again. Place chicken on a rack (I use a cookie-cooling wire rack) in a pan lined (for easy cleanup) with aluminum foil or parchment paper. With the air circulating, you will get a crunchier result. If you do not have a rack, line pan with aluminum foil, not parchment paper. 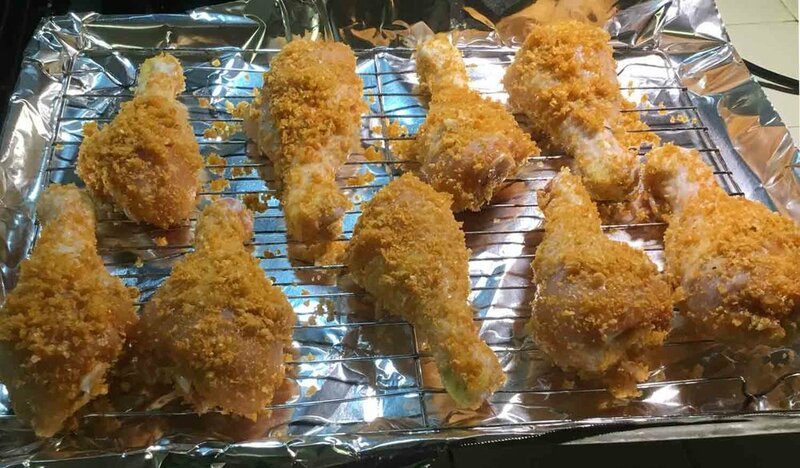 Take any extra pork rinds from the bowl and press into the drumsticks. Bake uncovered for 40 minutes.